Designing a blogger template from scratch is not as difficult as you might imagine. I had to search around a lot of websites and did a lot of googling to find out how to build a complete blogger template. Turns out it is pretty easy to build it yourself, but you need to know some stuffs before hand. The thing is, you need to understand how it works and should have an idea of how your blog should be. When we submit the template XHTML code to the blogger it is stored in the blogger database. When the blog is requested via a browser, the Blogger Parser parses the code and sends back the HTML output of the parsed XML code which will be displayed in the browser. Blogger template is fully coded in XHTML and Blogger Elements. In the above code we have defined a set of xmlns (XML Namespace) which are defined by Google for use with blogger. Namespace such as xmlns:b, xmlns:data, xmlns:expr lets us design our blogger web page and also to get data from the blogger database. xmlns:expr - is used to calculate expression for attributes(will see this soon). Note: You can change the above namespace name from b to blog or data to d at anytime. But it’s best to stick with what is default. Where should the menu come and how should it look. How will the posts appear, is it a 2 column or 3 column layout. Where should the widgets appear etc. The Blogger template layout is designed with Sections. Sections are the one’s which makes the layout of the web page(like header, footer, sidebar etc.). It is like the sections in HTML5. Above image shows some sample web page layouts which will give you an idea of what a section of a web page might be. The syntax to create a section in blogger is shown below. There can be any HTML code around the section code, but there can't be any HTML inside the section code. To define the contents of the section we must use the Widget element in blogger, which will be discussed shortly. Each section tag has the following syntax, which is similar to an HTML element with attributes. Each attributes have different meanings, that will be parsed by the blogger to render the elements final output. id(Required) - A unique name, with letters and numbers only. class(Optional) - Common class names are 'navbar,' 'header,' 'main,' 'sidebar,' and 'footer.' If you switch templates later, these names help Blogger determine how best to transfer over your content. However, you can use different names, if you like. maxwidgets(Optional) - The maximum number of widgets that can be added in this section. If you don't specify a limit, there won't be one. growth(Optional) - Can be 'horizontal' or 'vertical,' with 'vertical' as the default. This determines whether widgets within this section are arranged side-by-side or stacked. A section can contain widgets. It can not contain other sections or any other code. 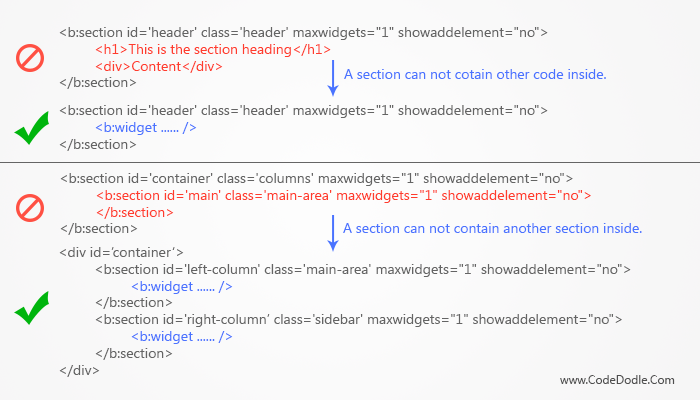 If there is a need to add a code around or inside a section, the section must be separated into two different sections. Note: By default there must be at least two b:section tags or else blogger will throw an error. Sections are made mainly using widgets. Sections are just layout elements, widget is with which the real data is displayed. A widget at its simplest form, is just a single tag, which is a placeholder for what should appear in the page element. There are some default widgets available in blogger and a custom widget can also be created. The data for the widget is stored in the blogger database and is accessed only when the widget is to be displayed. id(Required) - May contain letters and numbers only, and each widget ID in your template should be unique. A widget's ID cannot be changed without deleting the widget and creating a new one. type(Required) - Indicates what kind of a widget it is, and should be one of the valid widget types listed below. locked(Optional) - Can be 'yes' or 'no,' with 'no' as the default. A locked widget cannot be moved or deleted from the Page Elements tab. title(Optional) - A display title for the widget. If none is specified, a default title such as 'List1' will be used.